…..Excellent old melodrama: the bottle Imp. …..…..Humorous [? ]: les trois Bossus. …..Metempsychosis: from Magics [?]. The Body Changer. …..…..Scientific, from an Axxxx [?American; Armenian?] xxxx [pastor?] Hoyten [Hayton? ]: The Sand Bag [Bug?]. Stevenson has organized the list as a series of universal story-types (Revenge, return of the Husband etc. ), each followed by one or more titles as examples (Ulysses, Balzac’s Colonel Chabert, and Tennyson’s Enoch Arden are all examples of the Return of the Husband). Is this a preparation for a study of narratives? ‘on a cue from’ suggests that this is a list of stories to be adapted from other sources, and also reminds us of Stevenson’s own proposed titles ‘ The Bottle Imp: A Cue from an Old Melodrama’ and ‘The Waif Woman: A Cue from a Saga’ (L7, 436; Dec 1892, to Colvin), and of course Stevenson actually wrote ‘The Bottle Imp’ and ‘Rahero’, a long-ish narrative poem published in Ballads (1890). On this evidence, the document would then seem to be a list of possible narratives to write (in verse or prose), subdivided into story types. the bottle Imp: Stevenson read the story among the play collection of his neighbour Sir Percy Shelley, some time after spring 1885, and wrote his story with this title in 1889-90. Aladdin, Pollock: ‘talisman’, ‘magical object’, fits the stories of the Bottle Imp and Aladdin and the lamp. Pollock, publisher of the toy theatre sets described in “A Penny Plain and Twopence Coloured”, would seem more appropriate in notes for an essay or study of story types. the Twins: this could possible be the story of Louis XIV and his twin (the Man in the Iron Mask) told by Dumas in in Le Vicomte de Bragelonne. les trois Bossus: a humorous medieval French tale ‘Les trois bossus ménestrels’: a wife gets rid of her husband, killed by mistake as a result of his own actions prompted by jealousy. Magics [? ]: possibly the name of the author, something like ‘Murger’. The Body Changer: untraced reference. Hoyton/Hayton: The Sand Bug/Bag: untraced reference. Rahero: Hawaiian folk-tale that Stevenson took as the basis of a ballad in 1889. Ulysses / Colonel Chabert / Enoch Arden: stories of a husband’s return by Homer, Balzac and Tennyson. These titles seem more like examples of the story-type that ideas for stories to write (Stevenson cannot surely have been thinking of retelling the story of the return of Ulysses in verse or prose). The best clue to dating is ‘Rahero’, which seems added later in lighter pencil. This story was learnt by Stevenson from Princess Moë and others some time after Nov 1888 in Tautira, Tahiti (Lewis, 465-66). The mention of ‘the bottle Imp’ fits into this dating, since Fanny Stevenson reports that ‘he spoke of it several times when we were living in Honolulu, as being, in its ingenuity and imaginative qualities, singularly like the Hawaiian tales’ (Tus 13, 12), in other words in the period in Hawaii immediately after the stay in Tahiti. A list of ideas for a book of prose tales? (but including Rahero?) The interesting ‘on a cue from a French author: the Twins’ suggests a planned companion piece for ‘The Bottle Imp’ and ‘The Waif Woman’ in a collection of retold and adapted stories. Any suggestions will be welcome, as will any help with the untraced names and titles. 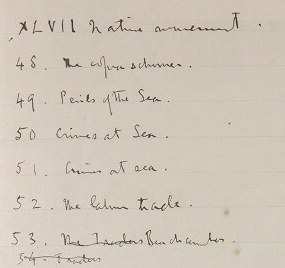 Stevenson’s day-to-day journals from his first two cruises in the South Seas – aboard the yacht Casco in 1888-1889 and the trading schooner Equator in 1889 – have attracted almost no attention from his biographers or from most literary scholars, even those writing about his work in the South Seas. The reason is simple. No one, then or now, seems to think (or to have thought) at all highly of The South Seas, a work that Stevenson called “my big book on the South Seas: the big book on the South Seas it ought to be, and shall” (RLS to Marcel Schwob, 19 August 1890, Letter 2238). And his day-to-day journals consist of almost 250 legal-sized pages in Stevenson’s not particularly legible handwriting – a formidable task for anyone merely to read. I have now had the pleasure of doing just that, thanks to four weeks of undivided research time that I was able to spend recently with these pages at the Huntington Library in San Marino, California. Unseen and unknown for more than a century, these opening pages are titled “Whites in the Pacific” (or “Sailors and Traders”, or “schooners, islands and maroons”, to give two other versions of the title from Stevenson’s outlines). And they offer a panoramic survey of life as it was actually being lived in the South Seas when Stevenson was there. He depicts an environment of whites of many nationalities far from the places of their birth and upbringing and of native peoples who themselves exhibit a great diversity of outlooks and cultures, a world made up of men living in harbour towns and on islands and aboard ships, and of men, women, and children, native and white, living on islands and in island groups separated by vast distances of open, largely empty, imperfectly charted, unlighted and unpredictable seas. It is a world in which life and commerce go forward according to rules and customs and uncertainties that would baffle or at least surprise most outsiders: a world of vitality, incoherence, danger, risk, and charm – and often of outlandish humour and misbehaviour as well. Beginning the book as he does – anecdotally, and with a focus on “Whites in the Pacific” – Stevenson frames The South Seas as a work of contemporary social history rather than as autobiography, narrative, journalism, or travel. This is not at all the same book that generations have known under the title In the South Seas. In the South Seas is a compilation that Stevenson’s friend Sidney Colvin made after Stevenson’s death for publication in the Edinburgh Edition of Stevenson’s works in 1896. Colvin reprinted the chapters on the Marquesas, the Paumotus, and the Gilbert Islands that Stevenson himself had seen published in 1891 in the New York Sun and other newspapers and in the English weekly magazine Black and White. But Colvin did not include the chapters on the pearl islands of Penrhyn and Manihiki. Nor did he include Stevenson’s account of Hawaii, possibly from a wish not to reprint Stevenson’s lengthy comments on leprosy and his account of visiting the leper settlement on the Hawaiian island of Molokai in late May 1889. Nor did he publish Stevenson’s own opening chapters, no doubt because he had no idea that they existed. The result was In the South Seas, a remarkable book as it stands but something completely different from The South Seas as Stevenson outlined and began writing it. and though the courtiers made very merry with us, examining the gold stoppings in our teeth, the sovereign but twice condescended to smile, never to speak. The queen on the other hand will retain a lively impression of our visit; for when one of our party played the part of Commander Goode [in King Solomon’s Mines] and snapped his false teeth at her, she became deadly pale and was thenceforth unable to remove her eyes from the performer. A younger lady, after the same experience, retired behind the royal privy, and I could observe her to experiment on the condition of her own teeth; they were fast enough and white enough you may be sure. We were aware of an elderly grizzled man, of a younger fellow, slim and tall and grave, and a girl of sixteen, with her baby in her arms. The girl had remarked our presence; and the family had come down the den to make us welcome after the island fashion, so unassuming to us clumsy and niggardly barbarians, so embarrassing. For the published version, Stevenson then draws upon, re-shapes, and provides context for material from this and three other places in his journal, transforming the account of Tari Coffin into an instance of the profound melancholy that he saw as dominating the outlook of the Marquesans. Extensive and representative selections from Stevenson’s journals, the complete text of his original opening chapters for The South Seas, annotations, photographs and illustrations, outlines, and much else – even a previously unknown chapter on the island of Manihiki – will all appear together in a new, complete reading edition of Stevenson’s “big book” that I now have in preparation. For the first time it will be possible to see and read The South Seas as Stevenson himself envisioned it and as he actually began it. The South Seas is a fascinating and major work that will add significantly – and brilliantly – to the Stevenson canon. 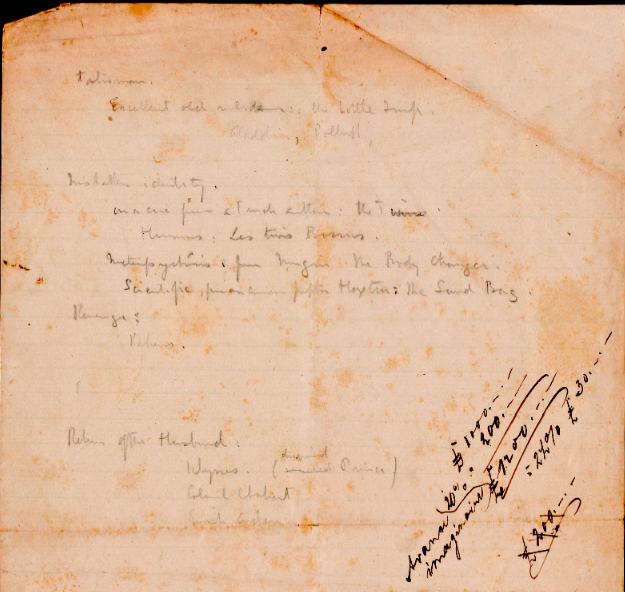 * Stevenson, Robert Louis, Drafts of the South Seas, 1889-1891. Yale, GEN MSS 808. Images of the whole MS can be viewed and downloaded in the online Beinecke Digital Collections: folder 2, folder 3 (folder 1 is just the original envelope that held the MS). For more information, see previous post ‘Major new Stevenson manuscript: In The South Seas‘.